Kolkata: A woman Tuesday moved the Calcutta High Court seeking permission to abort her 25-week old foetus due to medical complications. Hearing the plea of the woman and her husband, Justice Tapabrata Chakraborty directed her to appear before a medical board of state-run SSKM Hospital on Thursday for examination and to ascertain whether the pregnancy was to be terminated. Justice Chakraborty directed Additional Advocate General Abhratosh Majumdar to submit the report of the medical board before the court on January 25. The woman got married in 1999 and gave birth to a girl in 2004, their lawyers Kallol Basu and Apalak Basu submitted. While the woman is a homemaker, her husband works in a private company. She conceived again in October last year and, after four weeks during a check-up, the doctor suspected some abnormality and advised the woman to undergo a serum test. After the test, it was found that the child was at a high risk of being affected with Down Syndrome, they submitted before the court. They consulted two more doctors and after several more pathological tests it was found that the foetus was affected by abnormal development of cardiac organs, stomach, umbilical chord, apart from that of the brain which can lead to the child being affected by Down Syndrome following birth. 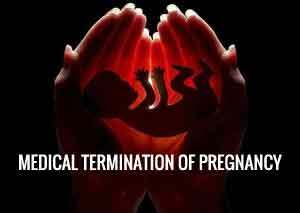 On January 13, when the foetus was aged 23 weeks, one of the doctors said it was a fit case for termination of pregnancy. A specialist doctor examined her again on Monday and said the foetus be aborted since it could endanger the life of the mother. Following this, the woman and her husband moved the high court to seek its nod. According to the Termination of Pregnancy Act 1971, permission of the high court is required for undergoing abortion if the foetus is more than 20 weeks old. Justice Chakraborty directed the woman to report to the director of state-run Institute of Post Graduate Medical Education and Research (IPGMER), better known as SSKM Hospital, on Thursday morning for an examination by the medical board. Majumdar told the court that on a request from the Centre to constitute permanent medical boards for such purpose at state-run medical facilities in all the states, the West Bengal government has formed the board at the premier referral hospital. Justice Chakraborty had on January 14 given the nod for termination of pregnancy of a woman following a favourable report by the medical board. The woman had moved the court claiming that the condition of the foetus’ brain was such that there was every possibility of the child being abnormal on birth and that continuance of pregnancy may be fatal to her.